A man has been shot dead at a pub in Birmingham. 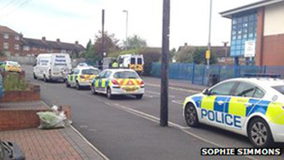 He was shot at the Dove Cote pub in Cockshut Hill, Yardley, at about 17:45 BST. Police believe it was a "targeted attack", although they said the motive "remains unclear". The man has been identified and his family were being informed, West Midlands Police said. Roads in the area have been cordoned off and will stay closed until Saturday, the force said. Ch Supt Alex Murray said: "We believe this may have been a targeted attack which happened in a busy pub in broad daylight this afternoon. "At this stage we do not believe this is connected with any other incident." Ch Supt Murray said detectives were already interviewing witnesses at the scene and "following a number of lines of inquiry". He said: "This would have been a shocking incident for witnesses and will have a huge impact on the local community. "I want to reassure residents that we are working hard to find the person responsible for this attack." A Yardley resident, who did not want to be named, said there were a large number of police officers at the scene. He said: "Cockshut Hill is closed... and a bus was stopped further down the hill at Duncroft Road. "It looked like they were moving the passengers to another coach, because it's right on the bus route. "There are a lot of wild rumours flying around about [the shooting] right now." The Stonegate Pub Company, which runs the Dove Cote, said none of its staff had been hurt in the shooting. In a statement the company said: "The incident is currently being investigated by the police and we are assisting them with their enquiries. "The pub is currently closed and [will] remain so while the investigation continues."